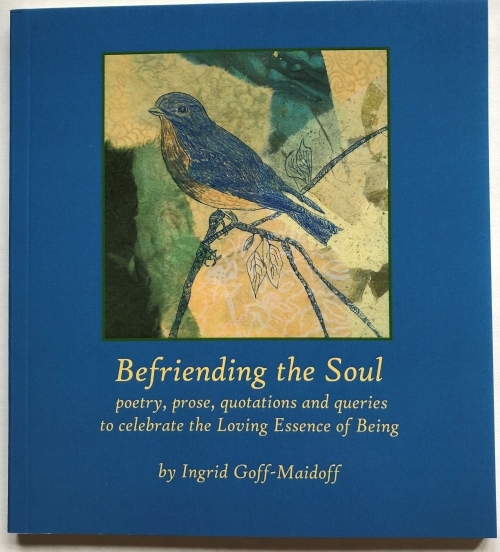 Befriending the Soul offers a rich and inspiring collection of poetry, prose, quotations and world wisdom for living in oneness with the essence of your being. The loving and gentle inquiry of these beautiful, inter-faith passages is what makes them favorite readings for spiritual gatherings, yoga classes, and for deepening personal reflection. The perfect gift for soul friends, this is a book for the bedside table, the retreat bag, or to keep beside your altar for centering meditation. Befriending the Soul is an exciting, harmonizing & heart-opening book! and never lose sight of the oneness we are part of. "I just wanted to let you know my beautiful book just arrived and I'm in heaven!! :-) This past spring I led a women's retreat on Joy for the women of the church I grew up in over 50 years ago! Your book on Joy made my job so much easier. These women were my church mothers and was such a gift. They have asked me back - while I think we all need a little more time I have a feeling your new book will be equally valuable. Anyway, many thanks for the sharing of your joy and your soul!!!" - J.C.
How is it that we might reach a time in our life, indeed in our culture, when we begin to feel the nagging sense that we have lost touch with some essential part of ourselves ~ something beautiful, lively, sacred and forgotten? When we look into the mirror, what do we see? When we look out at the world, how do we perceive it? How might we move from the limitations of judgment and despair to a wider, more luminous and loving view? A subtle shift in identity is required. We begin by cultivating intimacy with our own essence, our own soul ~ our soul which lives in intimacy with the essence of the world. of experiencing life and ourselves. and off the beaten path. Half! and flying in the invisible joy. I think that we are, all of us, both human and holy~ busy, lovable, beautifully made. I have an inkling, even, that if we were to discover that we were, in balance, half human, half spirit, or perhaps even essentially 90% spirit, our lives would infinitely expand. The human identity would not become any smaller, necessarily, but our divine identity- our relationship with spirit, would be felt in a much greater proportion, and on a much larger scale. To befriend the soul is to live in awareness of our divine identity; Infinite Consciousness; Unconditional Love; the energetic essence of life and living. One of them eats the sweet fruit. immersed, bewildered by his own impotence. and knows his glory, then his grief passes away. Your soul is the loving essence of your being. You are 1% human, 99% soul. even loves the pain of it. she does not belong to me. Our soul is the eternal presence within us that is not touched by time or space- which never dies, but leaves the body when the body dies. Many reports from those who have had near-death experiences point to the soul. I have a friend who tells a sacred story of the moment when her father’s soul left his body- the room shimmered with light. The more aware we are of our own soul, that conscious awareness that lives beyond the body, behind the thinking mind- the less difficult it is accept that the body will someday die. What happens, then, to the soul? We shall find out, won’t we?